The two main challenges with a classroom library seem to be making it cozy and inviting yet easily accessible, and keeping it organized. Here are some thoughts on both. Dust jackets from your favorite books. Quotes from your favorite books (poster or banner size). Book posters – there always seem to be some from the Scholastic Book Clubs. Photos of your students reading together. Construction paper circles with the names of books kids have read (they write the titles and put them up themselves; you just need to have the circles available). Labeled bins work really well, even for older kids. Rain gutters nailed to the wall can also be used to display books. You’ll need a check-out system of some sort. There are some good ideas at Kim’s Korner for Teacher Talk. 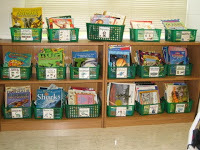 The class library is a great place for class books (books in which each student has contributed a page). You can also encourage kids to recommend books to each other with a Class Book Review Notebook. Use a 3-ring binder and a simple and fun-to-fill-out book review sheet. You can get a free one here. Encourage students to add their reviews as they finish books, grouping them alphabetically. 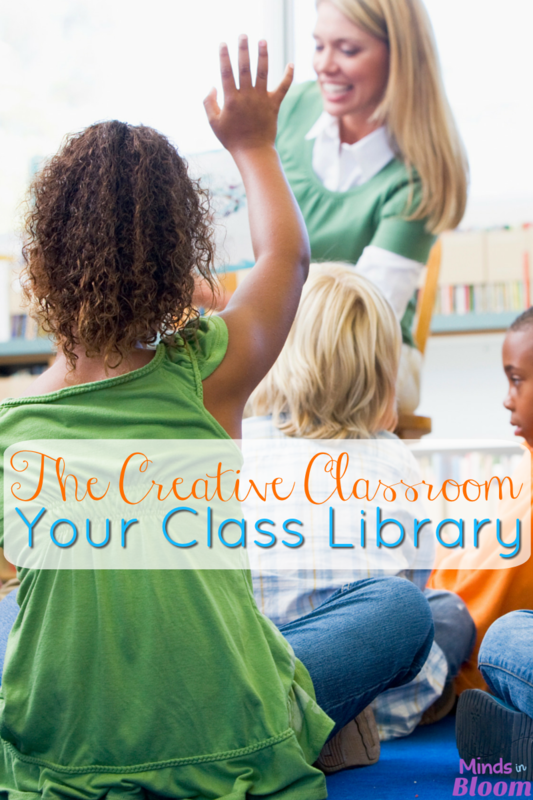 Call your class library something inviting like The Book Nook or The Reading Corner. Be sure to check out the rest of the Creative Classroom series, and be sure to come back next week when we’ll talk about the whiteboard/front of class. Looking for more class library ideas? Check out the linky party at The Sweet Life in Third Grade! Green bins picture from Coaches Corner. Book nook picture from Krista Franklin. Thanks for linking up to my linky party! What great organization ideas!! Thanks for hosting…always fun to share ideas!